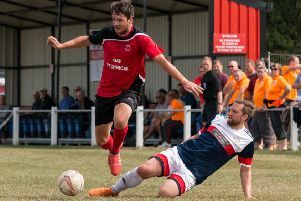 In only their third season of existence AFC Mansfield made history in reaching the last 32 of the FA Vase by beating Mickleover Royals 1-0 in dramatic fashion at The Raygar Stadium on Sunday afternoon. Man of the match Tristan Whitman hit the only goal a minute from time to send the Bulls through to a fourth round clash with Oldham area side Chadderton next month. The home side started the brighter of the two, playing with three up front and pushing the Bulls back without really threatening in the opening minutes. Scott Rickards had the visitors’ first chance on seven minutes, forcing Ashley Warner down to his right to deny the midfielder. A minute later Phil Buxton hit a volley wide of the mark from 15 yards. Kirk Francis raced clear on 10 minutes but his shot was a tame one and Jason White dealt with it comfortably. Daniel Martin then fired over the bar with a 25 yard free kick two minutes later. Mickleover had been the better side for the first 30 minutes but the game began to change in the last 15. A neat move involving Mark Dudley and Rickards down the left found Dean Rick in the box. Rick turned sharply and fired a low drive which Warner did well to turn away down to his left and Whitman fired the follow-up into the sidenetting. Another neat passing move on 34 minutes found Rick again, but this time he fired wide of the mark from 12 yards. Both teams had free kicks blocked at the start of the second half, but it was AFC that began to dominate possession as the game wore on. Whitman did well down the right flank before delivering a cross to the far post where Joe Naylor headed inches over the bar. At the other end Simpson fired inches wide from 20 yards. Whitman was again involved in the Mickleover box, a neat chip to the far post that Buxton just failed to make contact with. Then Tyrell Shannon cut inside two defenders on 82 minutes before firing high and wide from 12 yards. A scramble inside the AFC box on 85 minutes was only half-cleared. But, when the ball came back in, Steve O’Connell headed wide of the far post. Chris Timons made a superb tackle on 87 minutes to deny Louis Menson in the box. Timons then had the ball in the back of the net from a Buxton corner, but the goal was chalked off for a push in the box. There was an extended period of added-on time and just when everybody was preparing for extra-time the winning goal arrived. A long clearance from Mark Dudley found Whitman on the edge of the Mickleover box. The striker took a touch and, with keeper Warner advancing, Whitman cleverly lifted the ball over him and into the net, sending the AFC supporters wild with delight. There was just enough time for one more move from the home side which came to nothing and then that was it. Fourth round opponents Chadderton play in the North West Counties League Division One and are currently mid-table. The game will be played on Saturday, 17th January. MICKLEOVER ROYALS: Warner, Thompson, O. Buxton, Simpson, Aliguma, Martin, Foster, Roberts, Hamson (O’Connell 67), Shannon, Francis (Menson 75). AFC MANSFIELD: White, Meehan, Dudley, Kitchen, Timons, J. Naylor, Buxton, D. Naylor, Rick (Haslam 85), Whitman, Rickards. Subs not used: Tighe, Kimberley, Ludlow, Grayson. REFEREE: Richard Watson of Staffordshire.